Here see how to fix 100% disk usage on Windows PC guide using best solution methods. If your Windows PC is going through disk usage problem due to programs running on Windows take up disk space quickly, it can slow down your PC. But with some simple solutions you’ll be able to fix 100% disk usage issue on Windows running device to get your PC desktop or laptop back to normal speed. You can monitor system process, performance, app history, start-up programs, users, services and details in Task Manager. You can also see currently running system processes/program along with their current CPU, memory, disk and network usage. Under the Disk usage column in Task Manager’s system processes tab, you may notice that currently running processes are taking more disk space than usually, sometimes usage level could go up to 100%, which affects PC speed and slows it down. Some Windows users have been reporting that 100% disk usage is a common problem on their device. Here, i’m going to explain some solution methods which you can apply to see if they work to fix 100% disk usage problem on your Windows PC desktop or laptop, or Surface tablet/PC. The 100% disk usage problem is not new. In previous Windows 7, Windows 8/8.1, Vista & XP versions users experienced the same issue, as they do in Windows 10 as well. If you’ve been among those hard hit by 100% disk usage issue on PC Windows desktop/laptop, you might want to read solution method below to fix 100% disk usage in Windows. Before going ahead with the solutions, first see what are the main reasons behind 100% disk usage issue in Windows to get a better idea about the problem. When you run multiple programs, software, games and videos on a Windows PC at the same time, it can quickly clog up disk space on your device which slows down the device. Sometimes, running multiple tabs in Chrome, or using video chatting tools can also consume more than usual disk space. In face, web browsers such as Chrome, Microsoft Edge, Firefox, and others are one the main causes of disk space running low in Windows, which can render your PC unresponsive or running slower than its normal speed. In order to properly fix 100% disk usage issue in Windows, you must first be able to find what’s causing the problem otherwise you will just move around in circles without addressing the real cause. Mostly PCs with traditional hard disk suffer from this error. With rapid advancements in software technology, older disks are not well equipped to handle graphic intensive software, programs and process heavy processes. However, modern SSD (Solid State Drives) are not free from disk usage issue either. Maybe Windows update caused a sudden jump in disk usage, or corrupted system files, incompatible antivirus software, viruses or malware, software running with maximum features, multiple programs running at the same, or any other reasons for 100% disk usage. But if the issue is recurring in Windows with SSD, it means the problem is severe and needs immediate response. Now let’s see how to fix 100% disk usage on PC using solution method below. There are many ways you can tackle 100% disk usage problem. First of all run antivirus on your Windows PC to remove viruses or malware and see if the disk usage is back to normal. If its fixed, then there is no need to go through the processes below. However, if the problem remains, see the method below to fix disk usage in Windows. Open Google Chrome web browser on your Windows device. Go to Settings from the menu or just type chrome://settings/ in the address chrome address bar and hit enter. Scroll down and click Show advanced settings option. Disable Use a prediction service to load pages more quickly option. Now click on Extensions in settings and disable desired options. Head to Chrome://plugins/ in chrome browser and uncheck unnecessary plugins. Close Chrome browser and restart it. This should fix disk usage issue if caused by Chrome browser. Or else see the next solution. Press Ctrl + Shift + Esc on keyboard. Click on the Startup tab and disable programs from the list which you don’t want the system to load when the PC starts. To uninstall unnecessary app, right-click on its icon and click Uninstall from the drop-down contextual menu. 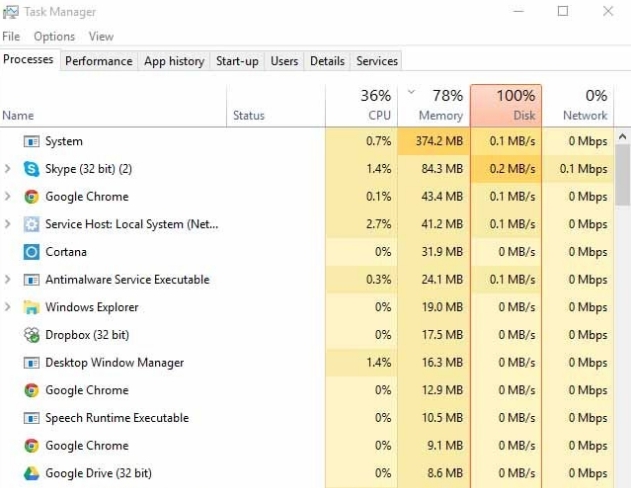 Restart PC and open the process tab in task manager to see if the disk usage issue is fixed. Press Windows key + R to open RUN dialogue box or click on Start menu icon, type msconfig and hit enter. Click on Services tab and disable unnecessary services. Hit OK and restart PC. Open Windows Powershell from Start: Click Start and type Windows Powershell. Right-click on Windows Powershell and run it as an administrator. If the Skype app is causing high disk usage issue, here’s how to fix it. This should fix Skype issue to bring the disk usage back to normal. If important system resources are causing 100% disk usage in Windows, you can use chkdsk command to purge your PC from errors that might be causing the problem. Press Y on keyboard and hit enter when asked “Would you like to schedule this volume to be checked the next time the system restarts?” in Command prompt. Restart PC to finalize changes. This should fix 100% disk usage in Windows. If you want to re-enable these features, replace stop with start in the commands above. Type deframent in the start menu. Click Defragment and Optimize Drives option from the search result. Select the drive(s) and click Optimize option. If the hard drives are cluttered with junk files, it can slow down PC and causes high disk usage. Run disk cleanup disk analyzer utility from the Start menu to clean junk and temporary files to speed up PC and lower disk usage level. All done. This methods have been reported by users to have worked on their Windows devices to fix 100% disk usage problem. Try these methods and let us know which one worked on your device in the comments section below.